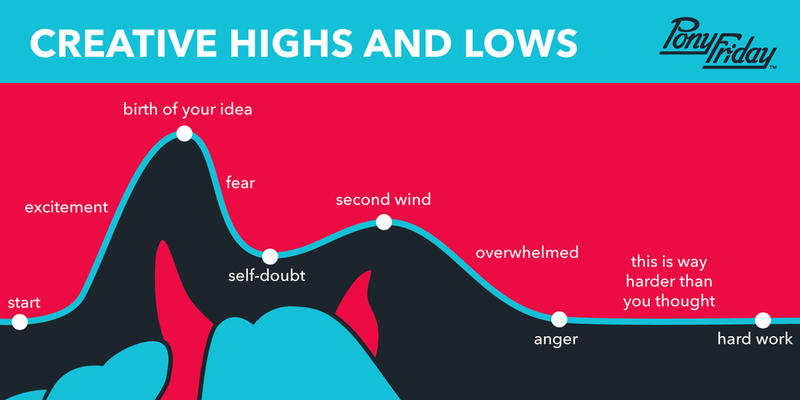 Okay, so we don't normally make pictures of charts... and we only let this one through because we needed to talk about the roller coaster that is life as a creative. The phases of the creative process are emotional. They can take you up to elation and back down to devastation, taking your self-worth along with it. If you're a diehard creative, you wouldn't trade this ride for anything. It seems like you can literally be addicted to anything. Chocolate cake, sugar, TV, Netflix, alcohol, drugs, exercise, nicotine, doughnuts, caffeine—bad habits and good habits. Being addicted to productivity and creativity are likely better choices than others, but they'll still demand your time in an obsessive way. The ups and downs are fairly predictable. You're going to get ramped up and excited at the beginning, followed by insecurities and a realization of how massive your undertaking is. Chances are that your own self-doubt will be echoed by your friends, family and peers. Pushing past the resistance takes mastery and internal strength, but you've got this. There will always be better ideas to be had. Every day we get smarter and smarter. Our ability to come up with a superior concept is always around the bend. Keep in mind that with every new idea you have to start back on the first roller coaster rise. You'll have trouble because you never finish anything. Completion gives you a deep satisfaction that partial achievements can't. Don't get so distracted by new and shiny on a daily basis or you'll never grow the ideas you have to their full potential. It's a process. It takes time. It takes diligence. It takes patience. It takes persistence.